"I used to be out on the streets selling things," shared a 16 year old girl named Marsilla. She paused and sheepishly look at the audience of children and parents. "Now I work with these kids. They love me. I love them. I'm a different person." I've heard testimonies like this before. This was different. Different because I was sitting in the fellowship hall of a catholic church in Little Havanah, Miami. I was reminded of what one social scientist said, "every child has the opportunity of becoming 1000 different adults." The trajectory of Marsilla's life has been radically altered. She will be a different adult because of this opportunity. This is the second summer for UP's Camp Courage--based in the heart of the Cuban-American community of Miami. Each day over 100 children and 17 Streetleaders provide a dynamic camp experience for this community. Most encouraging for me is that camp leadership is being provided by two former Camden Streetleader's--Pookie and Justin. Both these young men are now students at Eastern University. Both young men started in UP Camden at the age of 6. "They are remarkable leaders," shared Maria, a HR director for MTV. She serves as a volunteer with UP Miami. "I train a lot of managers and administrators. These young men are amazing. This Streetleader program is remarkable." I leave Miami amazed at what is happening. I am reminded what people can do when they are committed. Two years ago I was approached by Kristy--a lawyer--and Ana, a child psychologist. Natives of Miami. They wanted to make a difference in their community. As "volunteers" they have raised money, hired staff, and shared their love with hundreds of families. Last night reminded me of the early days of UP Camden. A period in our history when volunteers and caring people dared to make a difference--with scarce resources. Who knows what will happen next in Miami? There is a vision to grow. And with a little vision and a lot of hard work, ministries are birthed that will transform the lives of the next generation of leaders from Little Havanah and beyond. Today we focus on two new Dodge grantees, both doing admirable work in Camden, New Jersey. The first grantee is UrbanPromise, which has fostered a community of support for the youth of Camden since 1988 through a leading edge development program to equip more than 500 young people and their families with the skills necessary for academic achievement, life management and leadership. In 2009, UrbanPromise created Urban BoatWorks, a wooden boat-building program where students learn problem-solving, critical thinking and vocational skills. The boats are both real and symbolic in terms of the transformations that are occurring through the building process, and they are astonishingly beautiful. The program is anchored in Camden’s Waterfront South, and the Shipyard & Maritime Museum serves as an oasis in terms of place and space. The program is also more than experiential learning in terms of design, craft, and construction: there is a deeper vision to connect Camden youth to their waterfront, and there is a developing vision of a water trail and active environmental program. Previously a 6-week boat building program, Urban BoatWorks is now a year-long comprehensive program that incorporates maritime history, swimming lessons, sailing lessons at the Cooper River Yacht Club, and a community launching ceremony. There is also a strong intergenerational mentoring component, as seasoned boat building and sailing enthusiasts from the region lend volunteer support to the program. Urban BoatWorks also hopes to add a new boat building initiative – the Traditional Build – to their two other programs, the Stitch and Glue Program, and the Advanced Stitch and Glue Build. In addition to creating beautiful boats, Urban Boatworks is generating excitement and motivation for a program that nurtures learning, leading, creative thinking, problem solving, and character development in Camden youth. Dodge also welcomes the Arden Theatre Company as a new grantee. Founded in 1988, the Arden is an award-winning professional regional theatre that offers the highest quality theatrical productions and educational programs to the artists, audiences and students of Greater Philadelphia. Arden for All is an educational outreach program providing free tickets, show-related books and classroom visits from Arden Teaching Artists to economically disadvantaged students in Camden. Through this program, Arden has developed a model that combines in-classroom workshops, professional development for teachers and exposure to high quality performances. This allows children to get more from their classroom experience by embracing alternative learning styles, and offers the chance to travel outside their immediate neighborhood for a special experience that is both hopeful and inspiring. There are no other professional theatres in the area that offer this type of opportunity for Camden children and teachers. Recently, a delightful production of The Borrowers mesmerized an audience of Camden kids and equally enthralled their teachers. And in a special education classroom, two teaching artists/actors led a class, about which its teacher reported positive growth in her students’ behavior and ability to read, write, and perform in front of an audience of their peers. She also spoke highly of the training she received from the Arden staff which empowered her to incorporate these creative techniques into other coursework. Dodge is proud to support the work of these two imaginative and creative programs for the children and young adults of Camden. At the age of 10, Michaela Pereira had a hearing aid surgically implanted in the cochlear of her inner ear. That operation changed her life. Michaela discovered the challenges of living in two very different worlds--the world of the hearing and the world of the deaf. “The first big challenge of my life was finding my identity,” she continued. “Yes, I’m part of the deaf culture, but I also function within the hearing community. Sometimes those cultures are very conflicting. Sometimes it’s hard to know where I belong." However, and heroically, this past June Michaela took on one more challenge. As a Communication Major at Azusa Pacific University, she decided to tithe the summer between her junior and senior year at UrbanPromise in Camden. But last Monday Michaela made history at UrbanPromise. She started a Sign Language Class for 8 StreetLeaders—they’re our teen aged leaders who work as tutors, coaches, mentors and role models for the younger children in our many Summer Camps. This year over 65 teens are working at UrbanPromise! Instead of running the streets after work just to play or sleep, our teens can now enter a new world. They are learning a new language and experiencing the caring instructions of Michaela. And Megan is learning. First the alphabet--then the words and sentences. Teaching teens about new worlds, new languages, and new challenges is part of the UrbanPromise vision and experience. Hosting remarkable interns like Michaela allows UrbanPromise to offer the youth of Camden these incredible and unique opportunities. You can help me keep the several hundred young people like Megan off the streets of Camden this summer, helping them be involved in life enriching programs like sign photography, dance, cooking, and Bible Study--and now even sign language. 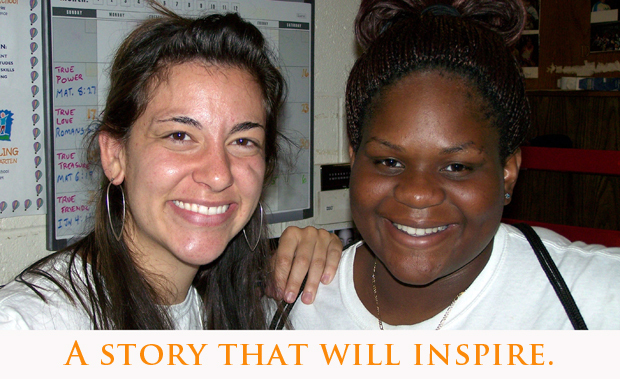 For just $25 per day UrbanPromise can employ a teen like Megan and help her experience a remarkable role model like Michaela. Help employ a teen for $125 a week, $500 a month or $1,000 for the summer. We are off to a great start of the summer at Camp Saved. One of the highlights of the first week was sand art. All the supplies (including all the sand) came as a donation from a school in MA. In Bible we are learning about truth - and this week true power. We are learning about how Jesus calmed the storm - now that is power. The disciples asked, "What kind of man is this that even the wind and the waves obey him?" We are learning that Jesus has true power because he is more than just a man - He is also the Son of God. It is great to be back at camp with old friends and to have the chance to make new ones! We would like to thank everyone who attended the event on Tuesday, June 7, 2011, at Bar 7 in Washington D.C.
As a result of this amazing and successful effort, over $56,000 has been raised to date. Resulting in 15 college scholarships for UrbanPromise youth attending college in the fall. This past week at UrbanPromise, I saw the Kingdom of God coming with power. I saw little children being welcomed in the Name of Jesus and God’s grace being heaped upon the poor, the vulnerable and the least of these. I saw campers, StreetLeaders, work groups, interns and staff revolving around one another in a joyful, spirited dance—like the Father, Son & Holy Spirit do. I saw a community in which the usual dividing walls of race, age, gender, culture and social class were powerfully overcome by the reconciling love of Christ. I saw fearful and indifferent standing still give way to risky and love-motivated road-crossing. I saw leaders who refused to lord their power and positions over others, but who served and laid down their lives—making the first ones last and the last ones first. I saw young people with visions and old people who dream dreams working together for the flourishing of individual lives and entire communities. I saw creation being restored—first fruits of a New Eden. I saw the city being restored—a preview of the New Jerusalem. I saw the power of wasteful love and naive grace transform the lives of moral failures and spiritual zeros. I saw mustard seeds of faith become trees so big that several hundred of Camden’s “birds” could perch in its branches. I saw a pinch of yeast work through the dough of entire communities, changing them from the inside out. I saw a plentiful harvest with plenty of harvesters and nets bursting at the seams with fresh catch. I saw Jesus feed several hundred children with a prayer and a box truck (and no money). I saw the faces of the abused, neglected and hopeless transfigured in the light of Christ’s glory. I saw women rejoicing over their lost coins, shepherds leaving the 99 to find the one that got away, Father’s scanning the horizon for lost children to come home. I saw the salt of the earth preserving it from decay, and the light of the world inviting others to praise their Father in Heaven. I saw the rich building smaller barns and not taking things easy. I saw the poor going home full, and being pulled out of their cycle of poverty. I love going to UrbanPromise and being a part of what God is doing in the city of Camden. I always leave encouraged, inspired and renewed. But most importantly, I leave knowing that although the Kingdom of God has not yet come in full, it has already come.